Home » How Do Student Loans Affect Your Tax Refund? Are you currently attending classes and are taking out student loans to cover the tuition costs? If so, you may have also wondered how this impacts your tax refund. The answer is not all that complex, but you need to understand a few things in order to get a complete picture of the impact that these student loans truly have. Student loans offer a variety of tax breaks that could apply in certain circumstances, so see if you qualify. However, they can also cause problems for you if you don’t pay your debt. Here are the most common ways that student loans affect your tax refund. While it may feel like an income source sometimes, your student loans should most definitely not be labeled as income on your tax returns. If you do this, then you will actually pay more taxes than you are required, and no one ever wants to do that! However, at the same time, these loans cannot be subtracted from your total income either. So, if you’re taking out $20,000 in student loans this year and your income is $30,000, you cannot simply say that your total earnings are $10,000. This would likely earn you an audit and require you to not only pay extra in the future, but cause many headaches as well. Due to the nature of these student loans, there is absolutely no impact to your taxable income. There is still some good news though. Since the government is very interested in citizens improving their knowledge and potentially earning more money in the future (which would then help the state of the economy), there is a tuition and fees deduction which will reduce your income by up to $4,000, depending on the cost of your classes from year to year. This is not driven by the amount of student loans you take out, but rather is driven by the actual cost of your tuition. If your college tuition costs are $10,000 for the year, then when it comes time to do your taxes, you can deduct $4,000 off from your income for the year, which will likely reduce your tax payment by $1,000 (but this ultimately depends on the tax bracket you’re in) or more. This is a great benefit that you should definitely take advantage of. Many people know that a house can sometimes be a great investment opportunity, partially because of the tax break on the interest payments. When you buy a house and get a loan at 4% interest, you will actually get some of this money back at the end of the year because the government wants to encourage people to buy houses (which again is good for the economy). The same is true for college loans. Because the government wants to see people attending college, they offer a similar credit to those that are taking out student loans to fund their college education. If you are starting to pay money on those student loans, then you want to be sure to tell your accountant about it because you will be reimbursed for a portion of those interest payments that you made on your loans. The maximum benefit is $2,500, and you have to make less than $75,000 per year as an individual, or $155,000 if you’re married. It’s really easy to report your student loan interest – your lender will mail you a statement right before tax season showing how much interest you paid last year on your student loan debt. If you had some or all of your student loans forgiven last year, you could owe taxes on the amount forgiven. Depending on your student loan repayment plan (mostly income-driven repayment plans like IBR or PAYE), the amount of your student loan debt that was forgiven is considered ordinary income – and you’re going to have to pay taxes on that amount. Here’s a full article describing wha you need to know: Student Loan Forgiveness And Taxes. Depending on how much student loan debt you had forgiven, this could be thousands of dollars. Be sure to talk to an accountant or tax professional if this applies to you because, under certain circumstances, you may be able to avoid this. Make sure you look at all of your options. If you don’t pay your student loans, you can actually get your tax refund garnished. This is called a tax offset – and it can take all of your tax refund if your student loan is in default. It’s important to note that you can only get your tax refund offset if your student loans are Federal loans and you’re currently in default (meaning you haven’t paid your loans in a long time). Just having a student loan won’t cause this to happen. Here are some common IRS facts that explain this a little better. If you’re tired of having your tax refund garnished, you need to get your student loans out of default. There are a few ways to do this, but student loan rehabilitation is typically the best option. 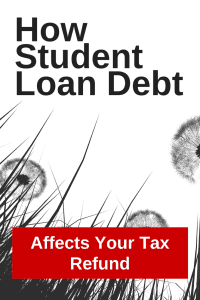 There are a lot of ways that student loans can impact your taxes. Make sure you fully understand what your debt means to you and how student loans affect your tax refund. The student loan interest has always been helpful with the return amount. But, it isn’t like I didn’t already pay all of that. Thanks for sharing this info. With tax time coming, this will surely help a few people. If I worked for about 10 months in 2015 and I paid about $3,000 out of my own pocket for college, and than I also took out a loan for $10,500 would I get a refund? Or would I end up owing money and it wouldn’t be worth it for me to file my taxes? You have to file your taxes if you earned income. You should file, as you’ll likely get a refund, but you won’t know until you fill out the forms. Okay so simply put, what ever interest is paid into a federal student loan, will we get that back in our tax return? Example, let’s say I have paid $1000 in interest, when I file my taxes correctly, will I receive this $1000 back in my tax return? No, that’s not how a tax deduction works, you’re thinking of a tax credit (Here’s the difference between a tax deduction and tax credit). The $1,000 you paid in interest is a deduction, which means it reduces your taxable income by $1,000. Simple example: You make $20,000 and pay 10% in taxes. Without the interest deduction, you’d owe $2,000 in taxes. However, if you deduct your $1,000 in interest paid, you lower your taxable income by $1,000. So, you’d pay 10% on $19,000 – meaning your tax bill is $1,900. That $1,000 in interest would lower your taxes directly by $100. I am a first year resident and I have over $200K student loan. I got a private student loan a few months ago, but the interest is killing me. Would I get a tax break if I paid off my private loan and switched to a loan by my parents? Can I show that I am paying them and get any type of tax write off? I would not be paying interest to them. No, that would become a personal loan versus a student loan and you would not be able to deduct the interest expense. I am a current college student and paid my tuition with a Sallie Mae loan. I have not paid anything on the loan yet since I’m still in school. Does it affect anything on my tax return? Should I still put it even though I have not paid any of the loan back yet? 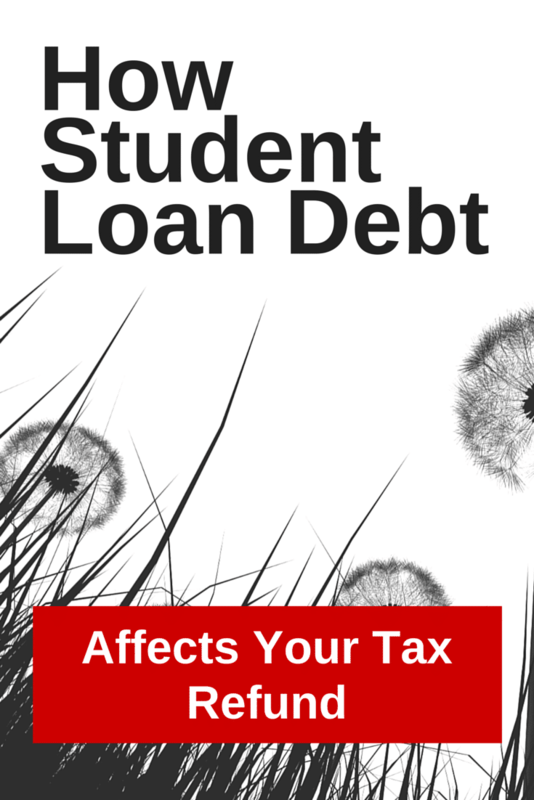 The only thing that impacts your taxes is student loan interest you paid. You will get a form called a 1099-E if you need to fill out anything related to your student loans. I am a graduate student that works just under full-time. In 2016 I was a full-time employee until I started school in August of 2016. I received a Federal Direct Unsubsidized loan and a Direct Grad Plus loan, which covered my tuition, fees, room and board, and program fees and direct loan fees. I was working less than full time (under 30 hours a week) from the end of August to present day. I received a loan refund (the amount that exceeds the cost of straight up tuition and fees and software packages paid directly to the university) which I used only for my rent, internet required for school, water, electricity and gas heat, text books, and parking pass paid to the university. I received the 1098-T form and I am trying to fill out the form-8863, but I have a headache from it. I have no clue where to put the amount in box 2 on form 1098-T on the form 8863 and where I put things in form 1040. I thought if you took out FEDERAL loans to meet the cost of attendance set by the university and you use your loan refund amount, to pay for room and board that it wasn’t taxable? I obviously understand that before I started back at school that taxes were in effect for my income, I was making student loan payments and have a student loan interest deduction. But from what I am reading on the form 1098-T, does this mean I have to PAY TAXES ON MY FEDERAL LOAN MONEY?????? Is this considered taxable income? Do I enter the amount listed in box 2 on form 1098-T on line 31 of my form 8863? I don’t qualify for the American Opportunity Credit. The estimated Cost of Attendance for my university was roughly $32,000 I received enough from my Federal Direct Unsubsidized Loan and my Direct Grad Plus Loan to cover the cost of attendance (the university was actually way off for the textbook and supply cost– a single professor used up the entire year’s worth of estimated textbook and supply cost). I chose to make payments on my private student loan, purchase cable, pay for vehicle and health care related, and pet related expenses with the income I earned at my job. Also, if I made payments to a supplemental health/life/accident insurance company offered by my employer, aka , pre- and post- tax payments where does this factor in on my taxes? My employer put roughly $550 on box 14 of my W-2. I apologize for the incredibly long post, but I just feel like I am running in circles. What program are you using to file your taxes? The software should walk you through it. The big thing is, you need to focus on Box 1 – what you paid, not Box 2 (amount billed). It only matters if payments were more than Box 2 – basically if you paid (Box 1) non-qualified expenses (more than Box 2 amount). And no, you don’t pay taxes on your student loan money. Since you said Box 2 was more than Box 1, all of your expenses you paid were qualifying. 1098-T only focuses on what you paid for your qualifying expenses – it has nothing to do with your student loans. You will get a 1098-E that shows interest paid on your student loans when that comes. Yikes! That’s crazy to do it yourself by hand – get some software! I am a fifty year old grandmother of seven. My loans started twenty years ago. I don’t even know what kind they are or how much they are. I am unemployed and have been married for ten years. I am not totally disabled but am not able to work at this time. I have been scammed once already. Where do I turn? I can’t make $350.00 payments. You need to work directly with your lender to get on track with payments. You’re still very young and can get this sorted out. Then contact your lender and get on an income based repayment plan. My spouse filed head of house hold when my kids live with and I take care of them. He doesn’t live in the house. I support them with my student loan and part time job. How do I report it anyway? What do you mean how do you report it? You don’t believe you and your spouse filed taxes correctly? You need to speak to a tax professional. My loans are over 20 yrs old and my deferments expired in late 2015 which threw me in to default as I was not financially able to make payments. They started garnishing 15% of my income from my job in 2017. Is my tax refund safe since they are taking out the 15%? I think they have me on income-driven repayment. Negative, if you’re in default they will not only garnish your wages, but also your tax refund. Everything they are garnishing isn’t even going towards your debt – it’s just going to fees, interest, and collection costs. I guarantee your loan balance is still growing. You need to take action to resolve this. There is a process called student loan rehabilitation you need to follow. You can do this yourself, but it can be a hassle and challenging. I’m on a repayment assistance where I do not have to pay and when 6 motnhs is done I re apply. now I am working and was just curious do my tax returns still go to my SL? Are you in default? Are you in deferment? There is no plan where you don’t pay for 6 months. Need help understanding. My daughter is going to school in the fall. Cost for a year is $45000 and does not qualify for grants, so besides hopefully scholarships (we are applying to as many as possible), the bulk of this cost will be student loans. I am certain she’ll need a cosigner, so that will be me as her parent. My husband and I make $118,000 a year. How will all this affect us tax wise? is there a better way to handle loan? I don’t even know how to apply for student loans. Fafsa only approved for $5000 a year subsidized. We are a family of 6, we are blessed to work full time but reality is that we are not “living it up”, yet this tiny loan is all she qualified for. Need help!! this is totally new to us, she will be first generation to attend college. If I may add, should the load only be in her name? or both hers and my husband and I? do we start paying right away? is there a benefit to this for our income taxes or is it better for her to pay when she graduates though interest is building up? Lastly, is there a better student loan option she should go for? sorry for the ? ?s but thank you!! hope to hear from you. First, $45k per year is a little outrageous for school. What is her degree? What does she want to do after graduation? I believe that you should only pay for what you can get a clear path to ROI for. A quick formula I use is never borrow more than you expect to earn in your first year after graduation. Second, for loans, they should be in her name. Since you filled out the FAFSA, in June/July you’ll receive an email from the financial aid office, giving you instructions on how to apply for Federal loans. Federal loans should only be in her name. Private loans should also only be in her name, but changes are high (90%) that you’ll need to cosign. You get these yourself. We recommend Credible as a comparison tool to find the best private loans. You can compare on Credible here. The only tax benefit you get is you can write off the student loan interest you paid. However, you typically won’t pay anything until after she graduates. You can pay as you go to save money in interest, but it’s not required. Her major will be in International Politics at a small private college. Even looking at a public university, we are looking at $25K per year. She will take some classes during the summer at a comm college, that combined with her AP credits, she’ll enter as a sophomore and will save her money. Her goal after she graduates is to work within the political realm. The financial aid office letter stated $2500 subsidized and $1500 unsubsidized. That leaves a huge balance, do I go back to them? or does the balance have to be private loans? I gather Federal loans are better. I am trying to find the best method to handle from a new student point of view. I’ve read so many scary stories on here that if there’s anything I can do to avoid the stress/heartache many others are going thru, I want to learn. Lastly, if all loans are in her name only, and we help to pay while in school, does that benefit our taxes since load shows her as debtor? There’s a lot to unpack here. First, you can always ask the financial aid office for help, but you’re not going to qualify for any additional Federal loans. You’re at the limit for undergraduate loans. These are the Federal loans, and the “best” you’ll get. As for your taxes, you can qualify for certain tax credits for tuition you paid for her. Especially since she will still be considered a dependent. But stop worrying about that – I’m still very concerned about why she is going to this school, what she wants to do, etc. The only reason she should go to college is to earn income in a certain career after graduation. It’s an investment – just like stocks, real estate, etc. If you go to the state school, and spend $100k (which is still very high and I can’t see why it would cost that), what is she going to earn in the career she wants after graduation? Her major (International Politics) isn’t a career. What does she want to do? How much will she earn in the given field in year 1 after graduation? Will she even be employable? These are the real questions you need to start with. You should focus on job/career and it’s income. Then, based on that, you can make a decision on how to best get there with a ROI. Maybe that requires living at home. Maybe that’s a year or two at community college then transferring to university. Maybe that’s working full time while going to school to offset the costs. There are a lot of paths to that end job/career. But you need to focus on the costs. If the math doesn’t add up, that’s sad for your daughter today, but it’s going to save you years (and decades) of financial distress. Hello, I have a subsidized loan out and since I’m still in school I haven’t paid anything yet. I recieved the 1098-T form with what I received from it and I am wondering what should I do since I need to file my taxes. You received a 1098-T due to the tuition you paid, not because of your student loans. You want to input the amount of tuition paid into your tax software, because you may be eligible for education tax credits or deductions. Also, if your 1098-T lists any scholarships, that could be considered taxable income. Speak to an accountant or tax professional if you have questions. But most of our favorite free tax software handle this for you just fine. You should speak to a tax professional and determine the best approach for your situation. The money taken from your tax refund offset went to fees and collection costs – your loan is still growing. You need to get your loan out of default and onto a repayment plan. Here’s a guide: Get Out Of Student Loan Default. Once you do that, you won’t get your tax refund garnished. So I am currently in the military and don’t have to start paying towards my Direct Unsubsidized Loan until 2021, but I started to during 2018 and was wondering if I am supposed to be recieving a form to report this while filing taxes? If you paid any student loan interest (which you likely did), then you’ll get a form 1098-E. Check this out: What is Form 1098-E Student Loan Interest Deduction. Also, you’ll need to use a tax software that supports student loan interest for free, like H&R Block or Credit Karma Tax. I received a 1098-E form but for like roughly less then $200. Do I truly need to file them with my taxes? Thank you in advanced. But need your help. I am a working student and have not been in school for over 7 years. I have been paying on my student loan. My 1098-E shows I paid $1,700 in interest last year. When I do the H & R Block Software, it asks if I was in a degree program and carried a full-time load? I was when I took out the loan, but I’m not anymore. Should I answer year? It seems to make a difference on whether or not I’m going to get back that money? I’m not sure. Thank you. H&R Block will ask you for both your student loan interest, and if you’re going to school today (for a potential education tax credit). If you’re not in school, you’d answer no. I have not paid anything on my student loan in over a year. It is currently in default. I am now on a forbearance until May. Will I get my tax refund? My daughter’s student loan from Navient is in her name but I’m a co-signer and have made every payment so far. What I need to know is can I claim the interest on those loans on my taxes myself since I have made every payment and she has not? You can’t cosign a Federal loan – the loan is either yours (a Parent PLUS loan) or your daughters. If the loan is yours (a Parent PLUS loan), you would claim the student loan interest. If it’s not your loan (i.e. it’s your daughters), then your daughter would claim the interest as Navient doesn’t know or care you’re paying her loan on her behalf. The easiest way to know is to simply look at the 1098-E received – who’s name and SSN is on it? If I did not attend school for 1 quarter out of the school year and have since started paying back my fed subsidized loan. Will it affect my refund? I had a part time job during that quarter I was not in school and filed my income information for that. I am also currently looking for work, but live at my parents house. If you’re not in default, it won’t impact your tax refund at all.